Data visualization is the ancient technique for communicating a message through visual means. The earliest visualization of data was found in a cave in Lascaux, in the southern part of France. It was the famous cave drawing called "The Stag Frieze" and it is one of mankind's oldest known attempts at visual communication. The drawing depicts a group of stags, their heads and shoulders, in what some interpret as a scene of stags crossing a river. It was originally supposed to depict stags running in a field, but legend has it that the client made a last minute change based on a different brand strategy devised by the agency's new creative director. Ok, early cavemen didn't strategize about brand identity, but they did understand the importance of communicating important messages through graphic visualization. One of humankind's greatest attributes is communication and all of the various ways we are able to achieve it. Since the dawn of time man has been drawing on walls, floors and on pretty much any surface that his messages would adhere to. Early cave people didn’t have Photoshop on a MacBook Pro, so they employed the use of crude paints made of berries and other organic materials to communicate on walls. The Egyptians took it a step further and innovated with hieroglyphs that would cover the halls of great palaces and tombs, communicating all that transpired throughout their rich history. In the 3rd century the Greeks created geometry where the questioning of the size, shape and relative position of figures and their properties would tell a story all its own. 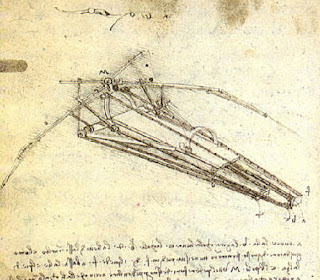 In the 13th Century, Gutenberg invented the printing press, and in the 1500s a man by the name of Leonardo Da Vinci, a scientist, mathematician, engineer, painter, sculptor, writer, and above all else the Senior Art Director of the Renaissance, single handedly ushered humanity into the future in one giant leap forward with his infinite curiosity and ability to communicate through, you got it, data visualization! More recently, in the 1980s and 90s, Edward Tufte, a professor of statistics, information design, interface design, and political economy at Yale, has been called by The New York Times, the “da Vinci of Data”. His three books, The Visual Display of Quantitative Information, Envisioning Information, and Visual Explanations: Images and Quantities, Evidence and Narrative are sacred tomes for anyone interested in the topic. Most people know the term "data visualization" from the multiple choice question on their computer science final in college. What most people do not realize is that data visualization is something we all use every single day. All of our visual communications are in some form data visualization. Everywhere you look data is being visualized right in front of our eyes. Today's data visualization is mostly generated by the use of computers and are often interactive visual interpretations of abstract data that convey complex messages. Until recently data visualization required the power of super computers and mad scientists who would be crazy enough to endeavor to crunch all types of complex permutations. Isosurfaces, volume rendering, streamlines, streak-lines, path-lines, tables, matrixes, graphs, maps, Chernoff faces, Hyperbolic trees, parallel coordinates and one of my personal favorites the Venn diagram. Today it’s gotten a bit easier. Let’s not forget the popular and familiar charts, the ones we love to use in our PowerPoint presentations, the pie, the bar, the histogram and the function graph, oh and the lesser known scatter plot. Those 10,000 songs you have in your iPod are able to be conjured up during your daily commute because of the wonderful innovations in data visualization. The cool dials on your car are a form of data visualization, and on the internet more and more web sites are employing data visualization as a means of navigating through tremendous amounts of data. Our industry is all about communicating messages and the internet is hands down the most powerful tool ever created to amplify communication. Today programmers are also designers, and they are producing animated design schemes that house massive amounts of data stored behind any product, brand, or service. The use of technologies such as Flash, databases, Processing, Papervision 3D and the like allow us to really stretch the imagination and visualize data in all sorts of crazy and creative ways. Today data visualization is not only beautiful to look at but completely interactive, everything you input in is immediately thrown right back at you in a breathtaking and entertaining and spectacular format that opens up new worlds of art and understanding to the user. We no longer need processor intensive server farms that are crunching billions of bytes of information a second. Today a typical home computer connected to the internet and most of our everyday programs offer us beautiful data visualization options that allow us to make better decisions as well as simply entertain us. One of my personal favorites is the iTunes visualizer that uses sound data to create amazing imagery that can keep a person occupied for hours on end. One of the pre-eminent data visualization artists working today has to be Jonathan Harris. His bio says he “designs systems to explore and explain the human world”. He’s done incredible and well-know data visualization projects such as www.wefeelfine.org and www.thewhalehunt.org. His latest work was commissioned by MoMA for the recent Design and the Elastic Mind show. The system created by Harris and partner on the project, Sep Kamvar, aggregates data from the world’s most active online dating websites and then presents it all on a 56” high-resolution touch screen interactive installation of a gorgeous design interface. One of the more interesting recent uses of data visualization is for the oldest and most popular volume of text known to man. The Holy Bible has been completely visualized through an amazing new website created by Freedom + Partners. The project is called WordDiamonds.com and its is one of the most unique data visualization engines available on the internet today. You don't have to be religious to appreciate the breadth of this project. The Bible has always been studied through the means of referencing and cross referencing, through searching and finding the hidden gems on every page and unearthing the secrets of man and his connection to a higher force. Commissioned by a private client, Freedom + Partners have stepped outside of the ad world in order to challenge its creative and technical muscles and to solve a puzzle that has always been a difficult one for man to sink his teeth into. To visualize the breadth of the Biblical texts, to enhance it with a powerful search function that puts every verse literally a click away, to make notes, compare and contrast with friends and loved ones and to even use it as a personal study and guidance tool for life, if one so chooses. Spectra merges the news spectrum and the color spectrum into an expansive news viewing experience that delights the senses. With comprehensive live news coverage, striking design, complete customization, dynamic browsing, human body interaction and many other unique features, Spectra brings A Fuller Spectrum of News to life in MSNBC's most immersive extension yet. The site was a collaboration between SS+K and their development partner, Fluid. Another very eclectic and special website created by Tha Ltd.
“HELLO, WORLD! SoftBank”, filled with touches of Yugo Nakamura’s brilliance, for the SoftBank telecommunications group (SoftBank Mobile, SoftBank BB and SoftBank Telecom), proposes a new and fun visual playground for the group to communicate their growing services and offers. Saatchi & Saatchi and Firstborn developed this rich user experience for Toyota hybrid owners – a virtual community website where hybrid owners can connect and share their reasons for purchasing a hybrid vehicle. Members can upload video and photo testimonials to demonstrate their reasons. The community is full of useful tidbits such as: quizzes, statistics, and FAQs to help create a cleaner and better future. Meet new friends, chat with other hybrid owners and share your reason for driving a Toyota Hybrid Synergy Drive® vehicle. As more complex data continues to become a larger and more prevalent part of our lives we as artists, marketers, sales people, brand advocates and advertisers, must master the practice of presenting complex data to our instantly gratified audiences in inspirational and prolific visual ways. Fortunately for us, the internet is our cave, so let’s go crazy and write all over its wonderfully sticky walls for the future to see! Craig, this is a wonderful primer that demonstrates data visualization not only to be a buzzword in the interactive market, but as a widespread solution for all visual communications. As the topic is almost as old as human nature in itself, it is obviously impossible to capture the essence of it in a single blog posting, but you certainly have done a great job in providing how it can be implemented through interactive design. I would love to see a follow-up on this article on your thoughts of what makes an interactive data visualization successful, for as much as I loved this article, much of it is publicly accessible knowledge and doesn't provide as much passion and personal insight as most of your other postings. I believe that the general insight you provide in your postings is what makes them so invigorating to read, and with your long-standing experience with the interactive market, I'm awaiting to hear your deepest thoughts on the topic, such as "What makes it successful in interactive design? ", "How much data is too much? ", or "Where do you think this will all go over the next two to five years?" There's simply so much excitement in this field that hasn't yet been realized, and I'm sure you are already aware. Wonderful comment and I embrace your questions as to what makes DV so successful in interactive design. "really guessed i’d distribute and allow you already know your personal weblogs is beneficial for discovered the advantageous solution.I honestly take pleasure in your blog.In the proper way, the posting is in actuality the most effective on this truly worth whilst subject. I concur alongside together with your data and can thirstily seem ahead to your arriving tweets. Clearly stating thanks is just not going to just be sufficient, for that incredible lucidity as part of the writing articles or blog posts. I will swiftly require maintain of your rss feed to remain abreast of any updates.Real perform and considerably being successful within your endeavours and web company tries.Regardless preserve up the advantageous perform.Thank you." My neighbor and I had been just debating this specific topic, he's often looking for to show me incorrect. Your view on this is great and precisely how I really feel. I just now mailed him this site to show him your individual view. After wanting over your web site I e book marked and can be coming back to read your new posts! Highly rated post. I learn one thing completely new on different blogs everyday. Deciding on one . stimulating to learn the paper content from different writers and study a little bit something from their website. I’d like to use certain of this content on my weblog you’re mind. Natually I’ll give a hyperlink here we're at your internet-site. Appreciate your sharing. Very effectively written information. It will be precious to anyone who usess it, together with myself. Keep up the good work – for positive i'll try more posts. Hiya clever points.. now why didn't i consider these? Off subject barely, is this web page pattern merely from an unusual installation or else do you use a custom-made template. I take advantage of a webpage i’m seeking to improve and effectively the visuals is probably going one of the key things to complete on my list.